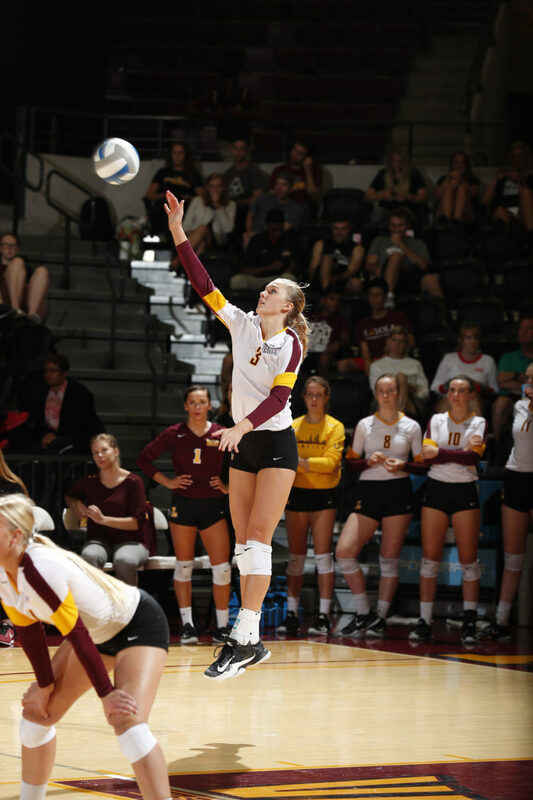 Steve Woltmann | Loyola Athletics Sophomore middle blocker Elle Van Grinsven had a match-high 16 kills against in Loyola's 3-0 win over DePaul Friday night. After losing to Missouri State University Nov. 17, Loyola women’s volleyball head coach Chris Muscat and his entire staff were let go upon completion of the team’s 2017 campaign. The Ramblers finished a 5-24 overall record and 4-14 in conference play. This change at the helm ended Muscat’s seven-year tenure with the Ramblers in which he amassed an 82-125 record in both Horizon League and Missouri Valley Conference (MVC) competition. 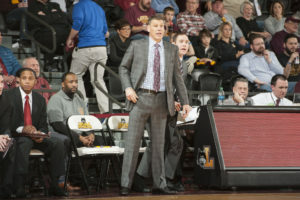 “We thank Coach Muscat for his seven years of service at Loyola and wish him well in his future endeavors,” Director of Athletics Steve Watson said in a statement. The players weren’t available for comment about the coaching change, per athletics department policy. With the search for a new head coach and staff beginning immediately, the question remains: How long will it take for the Ramblers to name their next head coach? In 2010, the process took two to three weeks before Muscat, who was then an assistant at the University of Missouri, was named head coach. Replacing any coach leaves the major question of roster turnover; the NCAA limits women’s volleyball roster size to 15 players and an average of 8.8 percent of players transfer each year, according to the NCAA. Loyola saw three players — 20 percent of the roster — leave the program when Muscat’s predecessor, Marcie Wolbeck, was let go. The Ramblers expect to return their entire roster from this season next year, one that could be anchored by six rising seniors, including outside hitter Gabi Maciagowski and defensive specialist Maddy Moser, and MVC All-Freshman Team nominee Elle Van Grinsven. The team could field a much more experienced group than last year if it were to retain its key starters. Despite being picked to finish fourth out of 10 teams in the MVC preseason poll, this same core struggled this year with Muscat in charge, winning only five matches. The season included a 16-game losing streak which lasted almost two calendar months. The team’s struggles were tied to its inability to convert on chances and its high error rate. The Ramblers only converted 14.1 percent of their attacks and had 159 more recorded errors than their opponents (639-480). The Ramblers took a big step back from their 2016 season, winning nine less games in total and five less in conference. They failed to replace the contributions of All-MVC outside hitter Morgan Reardon and MVC All-Tournament team nominee Sami Hansen. Other setbacks are shown in the team’s decreased attacking percentage of 14.1 percent from 19.4 percent last season, as well as increased mistakes on defense. Loyola made 66 more attacks in 2016 (708-642), and these decreases can most likely be attributed to the team’s loss of experience and lack of seniors. As the new head coach and staff come in, nothing is certain regarding Loyola women’s volleyball’s performance next season. As of now, the program is slated to return all 15 players.